The figure shows, for each group and subgroup of subjects, the average percentage correct on the test for perfect pitch. Within each group, early musical training mattered. However, holding ethnicity constant, there was also an overwhelmingly strong effect of tone language fluency. Courtesy Diana Deutsch. Mozart, Tchaikovsky, Sinatra and Hendrix -- these and many other of the world's most famous musicians have had "perfect" or "absolute" pitch. The ability, defined as recognizing the pitch of a musical note without having to compare it to any reference note, is quite rare in the U.S. and Europe, where only about one person in 10,000 is thought to have it. Often lumped into the mysterious realm of Talent, perfect pitch is - according to Diana Deutsch of the University of California, San Diego - probably more the result of nurture than nature, more environment than genes. "Perfect pitch for years seemed like a beautiful gift - given only to a few genetically endowed people. But our research suggests that it might be available to virtually everybody," Deutsch said. Unlike English, many East Asian languages, such as Mandarin, Cantonese and Vietnamese, are "tonal," so that a word's meaning often depends on the tone in which it is said (not to be confused with intonation such as sarcasm). Deutsch surmises that learning perfect pitch is, for fluent speakers of a tone language, akin to learning a second tone language. The study follows up on one Deutsch did in 1999, which found that native speakers of Vietnamese and Mandarin exhibited a form of perfect pitch in enunciating words, which led her to hypothesize that pitch was an extra-musical ability. Deutsch then set out to investigate perfect pitch in music. In 2004, she found that students at the Central Conservatory of Music in Beijing, China, all of whom spoke Mandarin, were almost nine times more likely to have perfect pitch than students at the Eastman School of Music in New York. That last study, however, left open the question of whether perfect pitch might be a genetic trait - since all the Mandarin speakers were East Asian. 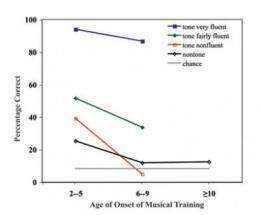 The present study looked at 203 students at the University of Southern California's Thornton School of Music, all of whom agreed to take the test in class (so there was no self-selection in the sample). The students listened to the 36 notes that haphazardly spanned three octaves. They attempted to identify the notes, and they self-reported their musical, ethnic and linguistic backgrounds - including whether they were very fluent in an East Asian tone language, fairly fluent or not at all fluent. Deutsch and her colleagues found that students who spoke an East Asian tone language very fluently scored nearly 100 percent on the test, and that students who were only fairly fluent in a tone language scored lower overall. Those students - either Caucasian or East Asian - who were not at all fluent in speaking a tone language scored the worst on average. Deutsch acknowledges that it still remains to be discovered why and how it is that some speakers of non-tone languages - Mozart, Sinatra et al., as well as Deutsch herself - have perfect pitch. She expects it to be related to either an exceptionally long "critical window" for language (and tone) acquisition, a very early musical upbringing, or both. "It also raises," she said, "the interesting question: What other exceptional abilities might be latent in an infant that we could bring out if we only knew what 'buttons' to push?" Learning a second language -- Is it all in your head? Try the Dave Berg Perfect pitch course. Famous Jesuit Priest quote: "Give me the child until he is seven and I will show you the man." The thing about this is that it is sort of already known by psychologists everywhere. If you take into consideration that every child is a blank slate upon birth, and any information can be trained into him, then the question is one of ethicality rather than action. What I mean to say is, is it ethical to teach a child the meaning of the world, or is it fit to rear him for the system we already have in place?